I am joining Kelly on Saturday for the Spring Sewing Party! Gather up all your supplies and some snacks to keep your energy up and sew the day away!! I have a couple of projects that are calling to be worked on, so I am hoping this will push me to get them done :-) Come join the fun. Well it is almost midnight, and I've almost got my "Sunday Best" finished. I think I am going to quit and head for bed. Tomorrow I will try to finish up and post a picture. It's been fun, my friends. Hope everyone had a wonderful time at the party. Thanks so much to Kelly and Joan for inviting me to come along :-) Be sure to check out everyone who participated in the the Spring Sewing Party! I was able to sew on my BOM and my February Schnibbles. What a great party! A week ago, I went with my dear hubby to pick up a car that was being serviced. As we were pretty close to one of my favorite quilt shops, I thought it would be a good use of my time and gas to make a quick stop. One of the reasons I love going to this shop is because they carry fabric lines that are more to my tastes. And of course they have so many lovely samples made up. Check out the ceiling tiles. This building used to be an old corner drug store. The floors also are old and creaky but so inviting. Sometimes I wish this shop was located closer to me, as I think it would be so fun to take some classes there. I also picked up this Miss Rosie's pattern. The lady who was checking me out wanted to know if there was another one on the rack? It looks so great to use for 30's fabric or even scraps. And speaking of Miss Rosie's Quilts, did you know that Carrie has published two new books?? And there is a little contest going on for those who purchase her book. Hop over to Carrie's blog and "read all about it!" Okay, now I have to get back to my February Schnibbles quilt. Having to start over, because I was not happy with my first fabric choice. Hum...... We All Sew. Guess I will have to check this one out. Whoa, not only is Pam listed, but sweet little JayBird, A Quilting Life and All Things Quilty too! Where have I been?? And if you have not already been there, go check it out here. Lots of free sites to visit..
For Christmas this year, my sweet children chipped in and bought me a new camera. It is smaller then my old Sony digital, which is great for carrying in your pocket or purse. It has a nice large screen to preview my pictures (the Sony screen was about 1" x 1 1/2"). So I thought I'd need some kind of protection when this little camera is rummaging around in my purse. I've never made anything like this before, so I set out with no plan in mind. But little by little I made some progress. Even though there were a few hic-ups and the seam ripper made a magnificent appearance, I ended up with a useful little bag to carry the camera. I'd like to thank Alice Grace for sending me this lovely fabric. I fell in love with it the moment I saw it. Aren't we all just so ready for SPRING!!!! Many of you who follow my blog know that I live in the sunny state of Florida. In the last 6 weeks, we have had rainy, freezing cold weather conditions that are not the usual fare for this time of year. And although we are not experiencing the blizzard conditions of the north, many of the Florida homes (especially the older ones) are not built for cold weather conditions. It was normal to build homes with lots of windows for cross ventilation before the days of AC. These very efficient cross ventilated non air conditioned homes usually freeze in the winter time. Which is not usually a problem when you have two or three days of cold and then return to the balmy temps of 70 and 80 degrees. Yesterday was a miserable day by Florida standards. It was cold! It was rainy! It was gloomy! BUT for us quilters there was a little respite for the cold weary on the Central Florida western shores. We made our way north to visit the West Pasco Quilt show, which is put on every two years. It has always been an outstanding quilt show with about 300 quilts on display. There are usually lots of vendors and lovely quilts to take in. My quilting buds and I left there a bit disappointed in this show, but it was a good field trip for us cold weary Floridians. Here are a few of the quilts that were on display. I think if you click on the picture, it will enlarge the quilt. There is a terrible drawback to attending a quilt show when the weather is bad. You see, the husbands don't have anything to do. They can't golf, or play shuffleboard, or whatever. So they accompany their wives to quilt shows. And peeps, you know how it is at a quilt show. It fills up quickly with quilters, but if you add to the mix their husbands (who by the way stand in the middle of the aisles and chat), well it doubles the amount of people in the exhibit hall. I don't want to make this too picture heavy, so I will post more pictures next time. Don't forget to give your loved one a hug. Do you like to shop? I find that some people are "real" shoppers, who forge out every bargain basement and sale rack. Then there are those people who shop out of necessity. Go in, find object, pay clerk, out to the car! There are two things that I do NOT like to shop for. One is a car and the other is furniture. Other then that I am not a compulsive shopper of shoes or clothing. I don't mind grocery shopping or other necessary types of shopping. But the line is drawn when I step into a Quilt shop. Something magical happens. So many lovely colors and textures to entice the eye gate. 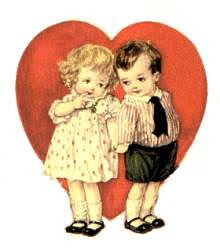 My sweet hubby took me out for an anniversary dinner recently, and this sweet man asked if I would like to go to the quilt shop that was near the restaurant. I really hated to make him go into this magnificent shop that has over 8,000 bolts of fabric. But, just to please him, and to wait out our time before we needed to be at the restaurant, we went. Enter through the closet door, as Lucy does in "The Lion, the Witch and the Wardrobe" into a world filled with Moda, Benartex, Red Rooster, Michael Miller, and so much more. How can we walk away without breathing in the delights of reds, yellows, greens, blues, and every hue of the Rainbow? No, this kind of shopping is my weakness. Not only looking at these gorgeous fabrics, but feeling the very threads of splendor. Even with an abundant stash, one cannot leave a place like this empty handed. I was always fascinated with this Postage Stamp Quilt. It measures 83 1/2" square, using all kinds of 1 1/2" squares. I was hesitant to make a quilt using 3216 squares! And that was just the scrappy fabrics, not including the accent colors. So when Heidi from Handmade by Heidi suggested having a Postage Stamp quilt along, I thought here is my chance. I am so looking forward to using up a lot of my scrap pieces that I have collected over the years. Aren't quilters some of the nicest people you have ever met. Even if you have never met them in person? There are so many wonderful quilting blogs that I visit every day. I have some on my blog roll, some I read off of my Google Reader, and even some that I read from Quiltersblog.com. Of course I cannot read them all every day, but the ones that stand out have always shown a wonderful attitude. Allie from allie-oops - Sweet Happy Life has given me a (sweet) Lemonade Award! I am so honored that she would think to send it my way. And the rules are that I now get to pass this award on to 10 other blogs. 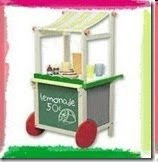 Put the Lemonade logo on your blog or within your post. Nominate at least 10 blogs with great attitude or gratitude. Link the nominees within your post. Let the nominees know they have received this award by commenting on their blog. Share the love and link to the person from whom you received this award. See I told you I couldn't just name 10! And for those of you who have an award free blog, just accept this as a thank you from me for all of your generous sharing on your blog site. Your wonderful attitudes have brought inspiration and encouragement to me and many others out there in the blogging world. The pink and brown top that I've been working on is still growing. I thought it would be fun to add some pinwheels into the mix, so I'm sewing away. The strips I have left are just wide enough to make a 6" pinwheel. Now where they will end up on this quilt is still the question, but it's been fun to figure out how to best use the left over fabric pieces. for a lovely selection of Easter fabrics. A few months ago I signed up for a Pay It Foward with Shelly over at Prairie Moon Quilts. Shelly sent me this lovely vintage doily that she embroidered. Shelly knows that I love vintage things and I love all things tea (you can visit my thrifting blog). She took the time to unpick all of the crochet lace edging, fixed the middle section and embroidered the cute teapot. I was so delighted to receive this PIF, and now I am offering to pay it forward to three receipients if you will just sign up on this post. I hope that everyone is staying warm and safe. 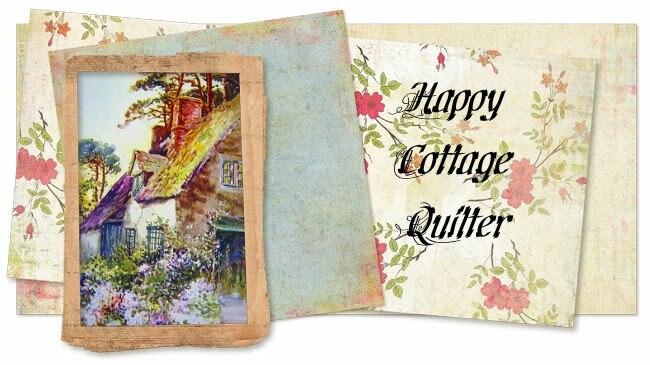 Enjoy your weekend and Happy Quilting! I think I am really going to like this Block of the Month series. Such pretty colors. Do you ever feel that a new project will generate feelings of accomplishment? I've had a hard time following through with Blocks of the Month projects. 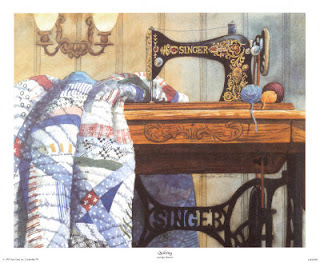 This year I am planning to work on the BOM Mystery quilt that Cathy from Quilting on Turtle Hill generously sent to me. I LOVE the fabrics, and having them somewhat pre-cut may be good motivation for me. And tonight my quilting buddies and I visited a guild and heard Sue Nickels give a little presentation. Hope everyone is staying warm, and quilting, quilting, quilting. First off, thank you for all of the lovely comments on my Madeline. I can't tell you how much I appreciate getting feedback. Your comments truly do make me happy. And check out Sherri's and Sinta's blogs to see the Parade of Schnibbles. I love to see how everyone takes a pattern and creates their rendition of that same pattern. This month it was "Madeline". I still think she is lovely to behold. And I have been working on trying to come up with a pattern design to finish the little quilt I started on the Friday Night Sew In. Hope you are having a warm quilting day!